North Korean leader Kim Jong-un’s comment about nuclear weapons in his New Year’s speech has evoked mixed responses from experts here. “We declared at home and abroad that we would neither make and test nuclear weapons any longer nor use and proliferate them, and we have taken various practical measures,” Kim said in a televised address on Tuesday. Thae Yong-ho, a former North Korean diplomat, said Kim’s speech shows there is no change in Kim’s stance on clinging to nuclear weapons. “His 2019 policies toward the US and South Korea are likely aiming for a stronger strategic position as a nuclear state and seeking the lifting of sanctions by narrowing down the nuclear talks with the US to nuclear arms reduction,” Thae said. He warned that South Korea and the US will not be able to make significant progress in building their relationships with North Korea this year if Washington pursues North Korea’s dismantling of its nuclear weapons program. 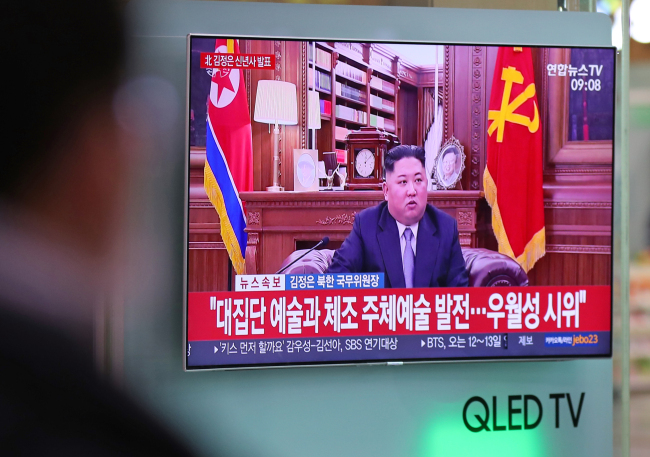 Two other phrases from the address that caught experts’ attention were “build a lasting and durable peace regime” and “advance toward complete denuclearization,” both of which Kim expressed his willingness to do. The use of the term “denuclearization” marks a meaningful step for the North Korean leader, who had not publicly used the word before, according to Park Won-kon, a professor of international relations at Handong Global University. “There is still controversy as to whether North Korea wants genuine denuclearization, but what is clear is that the message was carefully designed for US President Donald Trump to hold a second summit swiftly,” Park said. The North’s key purpose for the speech is to secure a favorable deal at the meeting with Trump as it did from the first summit in Singapore in June, when Pyongyang gained significant benefits, such as the suspension of US-South Korea joint military exercises, he said. Having agreed to work toward the complete denuclearization of the Korean Peninsula, the North has not conducted any missile tests since Kim and Trump’s meeting. Yet a moratorium on nuclear tests and long-range missile launches was not part of the summit agreement. “Kim’s pledge that the nation will not make nuclear weapons is a message for the US, giving the US a small gift by adding ‘the making’ part on what Trump wanted -- no nuclear and missile tests,” said Shin Bum-cheol, a senior fellow at the Seoul-based Asan Institute for Policy Studies.